Treble keyboards are custom fabricated for maximum responsiveness, exciting vitality and tonal performance. Precision-fitted guides are surfaced with a specially formulated, lubricated material selected for its non binding properties. Dual suspension key pinning system provide the critical balance needed for “velvet” response, swift action, and perfect alignment. Pin point weighting at the front of each key assures unprecedented balance over the entire keyboard. Rigid duraluminium “L” extrusion furnishes complete dimensional stability and absolute warp-resistance over the full length of the keyboard. Each key is of hardwood covered with heavy prime plexiglas, matched for uniformity of colour and beauty. Resilient, air filled felt bumpers provide a thick cushion under each key to eliminate mechanical sounds. Seasoned kidskin leathers, hand-cut, hand rolled, in graded thicknesses, conform exactly to the reeds’ size requirements for instant response. Larger leathers are reinforced with spring steel boosters, carefully applied to eliminate any possible sluggishness due to size of leather. Blocks for the treble reeds are firmly anchored for uniform tension over their entire length, retaining their original airtight seating for maximized compression and thus directing more air at the specific reed in use. Reed blocks are multi-coated with varnish, polished to a lustrous finish, to eliminate warpage potential and enrich tonal quality much like a piano soundboard. Three-piece pad assembly is made of choice base material, carefully fitted with heavy felt and fine suede. Valves are individually fitted for perfect, self-gasketed seating, complete dependability, and sound-proofed performance. Rods are precision contoured and polished to resist corrosive elements and for reliable operation. Plates and slides are burnished to a chromed sleekness which permits positive seal and surpasses self-lubrication for friction-free performance. Extra deep fold construction provides maximum uninterrupted air swirl and requires less exertion in playing. Rounded chromed steel corners are professional-type, selected for strength and their long-term retention of highly polished beauty. All folds have a heavy, textured tape reinforcement with cross-knit process for long-wearing quality. External hardwood frames are carefully fitted and adjusted on each instrument, to assure the absolute hermetic seal necessary for flawless compression. Piston thrust is instantaneous and set uniformly for free gliding operation, without any sluggishness. Precise registration of bass machine includes regulating of pin-play for immediate response and uniformity in all octaves, which will require less service. Curvature of upright pins is calculated to instantly activate bass response to slightest finger pressure. Chrome-polished duraluminum rods and friction free brass pins are selected for strength, corrosion-rejecting properties, and trouble-free performance. Thick felt of air-padded porosity silences all mechanical noise at contact points within bass machine. Multi-ply sound-proofed bass board is a patented formulation which permits fitting to micrometer tolerances for efficient and silent mechanical operation. The nearly 8500 parts of a Victoria are all of carefully selected materials, painstakingly crafted to produce a superb musical instrument and provide the greatest possible value in each model’s price range. Fine, pre-cut woods are patiently stored at least three years under rigid temperature, humidity, and air current control, for full seasoning cycle. 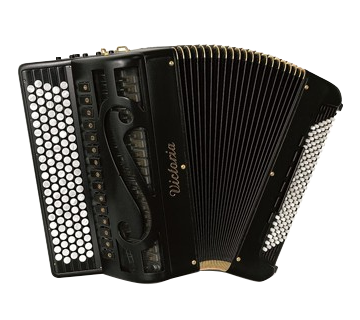 After careful inspection prior to use, only the flawless woods are accepted for Victoria Accordion production. 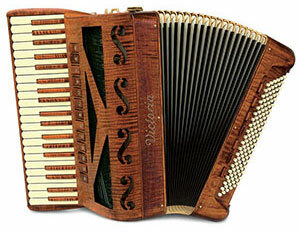 An average of 300 square inches (750 Square cm) of prime suede and kidskin is used for each instrument. Leathers are dated and ideally stored for additional ageing of at least two years, before selection is made for use. Chrome hardware is all of the finest quality with heavy plating for long-lasting beauty and durability. 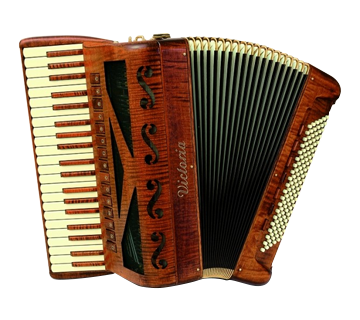 Celluloid, specially formulated to Victoria ‘s standards for extra heavy grade with deeper colour pigmentation permits the triple sanding and buffing required for the rich finish of these accordions. Celluloid, too, requires years of ageing under ideal conditions to eliminate its tendency towards shrinkage. Victoria’s gravitational center suspension eliminates all swivel and bounce through scientific distribution of proportioned weight. Complete bellows control, without the handicap of weight, simplifies even intricate dynamics and makes a Victoria “feel” lighter than it is. Integrated keyboard backpad of luxurious velvet is textured for slip proof comfort against the body. Bellow-Guard patented feature (included on some models, optional on others) protects bellows completely; far superior to ordinary backpads which rub against bellows. No other guard provides this degree of freedom in bellowing!